I really envy you guys who'll watch the games in Vancouver (Richmond and Whistler)! ↓Thank you for your cooperation! ① Order by December 1 and receive 50% off. ② Order before December 1 and receive 50% off. ③ Order on or before December 1 and receive 50% off. I'll be over there at or before 7. 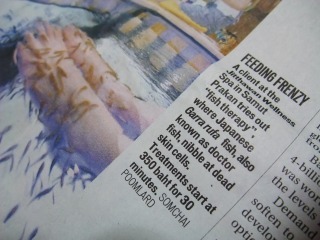 A client tries out "fish therapy", where Japanese Garra rufa fish, also known as doctor fish, nibble at dead skin cells. I miss Vancouver so much. Happy Belated Birthday to everyone who was born during the last few days! Hi to all English learners! copyright © Fear No More ++English for Life++ all rights reserved. template by Ringo.